I went to the WFMU record swap this weekend. I spent less than I have on previous occasions, about 50 of your American dollars. There were tons of records I would have liked to have purchased, but I decided I wasn't going to spend more than $20 on a record, and only buy things I could post here. I did end up buying stuff you probably will never see as they are otherwise available but I decided I should pick them up anyway. I did not, however, spend more than $20 on a record (although I was tempted to, just so I could share them with you). I do admit to feeling a little overwhelmed, it has been a while since I went to something like this and I didn't really have the patience to slog through every single LP in the room. So I only looked at tables that were selling singles, although I perused their LPs as well. This one had the following description: "1980 Alaska Female Vox Artwave" -- sold! At $5, how could I pass it up? According to them, guys will even "do it with sheep". That would have to be one hot ewe, if you ask me. This record rules, by the way. 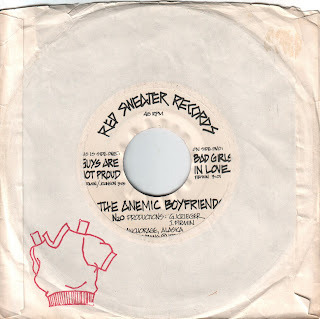 Ladies and gentlemen, for your listening pleasure, The Anemic Boyfriends. You might be interested to know John Peel - BBC DJ extraordinaire - had a copy of this in his famous box - that housed those singles he loved, set apart from his collection.